My first memories of the UA Cinema 150 weren't of a movie there, or even of its impressive facade at the corner of Asher and University. It was of the theater's back. I was very small, maybe five at the time, and eating at Wendy's with its old fake newspaper tabletops. All the adults around me were busy talking to each other, and I was pouring Wendy's chili flavoring out of a little gold packet onto my meager little burger. A crowd of kids, maybe my age, maybe older, were ushered through the doors by a parent trying to control them, with about as much luck as lassoing flies. They were rowdy and happy and chattering on loudly, somewhat deafened by their experience in the huge dome next door. I remember the adults in my group commenting on children that should be seen but not heard, and the comment passed around about going to the movies was really different these days. 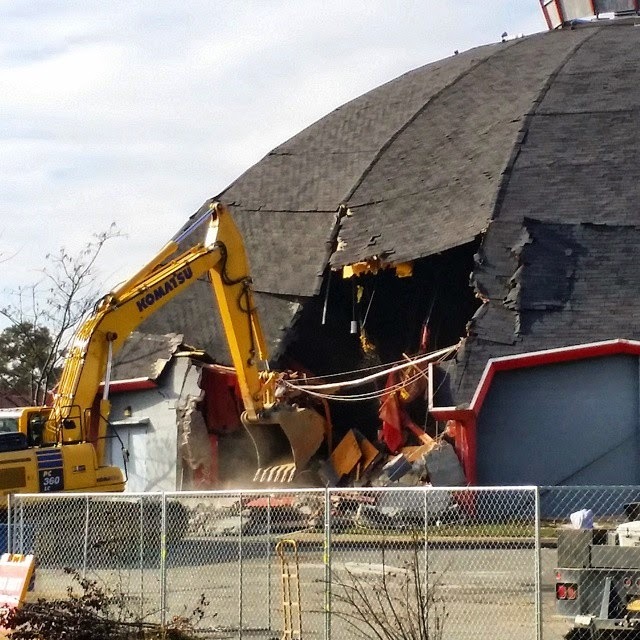 I wanted to go see what was inside that big round building. I wouldn't take in my first movie there -- that honor was saved for a very special outing with other kids, probably from my daycare, at the Heights Theater, where there was a puppet show before the main feature, The Black Stallion. But it wasn't long before I walked into that glass lobby for the first time, passed the concession stand and walk through the double doors into a red velvet-draped world where anything was possible. Going to the Cinema 150 was a special occasion. 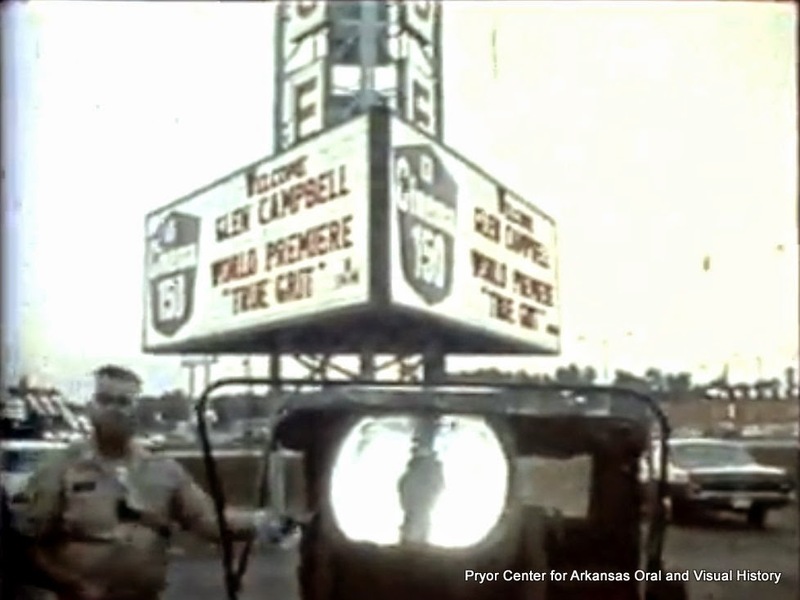 It cost more to go to the theater -- a whole 50 cents more than either the UA University Quartet across the street or the UA Four in southwest Little Rock. A movie had to be really big and really cool to make it to the 150. But there were times when special things happened, like a summer where some of the great movies of the past were played on Saturday matinees, like The Jungle Book. and thinking that an actual hole had been torn in the roof. Yes, I was quite young. As I said, little movies were seen in little theaters, and big ones at the Cinema 150. Never did the jungle scene at the start of Raiders of the Lost Ark feel so real than when that giant boulder came rolling towards the audience, threatening to come out of the screen and flatten viewers. Flinching occurred, and some scooted down into their seats. The Empire Strikes Back was even larger, with Darth Vader off to the side breathing heavily into his mask. Superman in his Fortress of Solitude. Violet putting the rat poison in the coffee. Marty McFly ducking into the DeLorean and speeding away from the Lebanese terrorists, leaving behind dual tracks of flame. Young Indy running into his father's house yelling about the relic rustlers he had just evaded. Hippos danced and Mickey Mouse panicked as that epic dungeon flooded as I looked up. 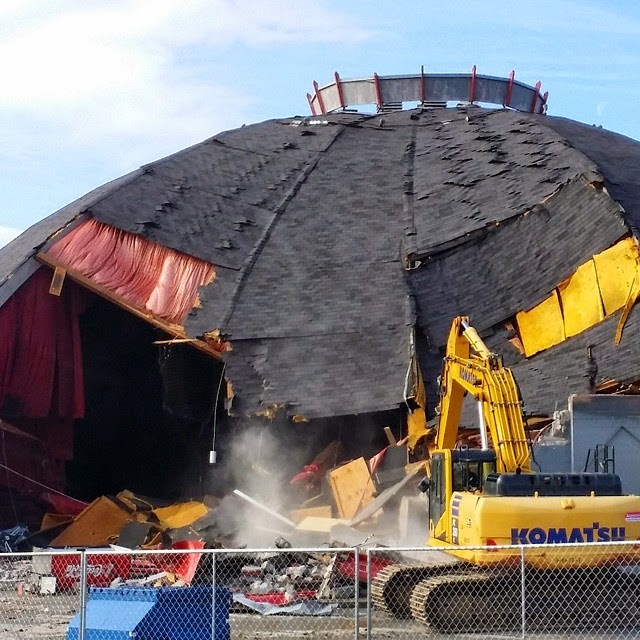 It was a destination, this big dome. Good restaurants stood alongside University Avenue, and the Optimist Club Christmas tree sale would be on the opposite corner each December. The intersection became famous for its traffic, with opposite corners being consumed with K-Mart and the University Shopping Center with Food4Less, Schuster's and Service Merchandise. My earliest days, there would be someone escorting me to the theater, but once I got to be maybe 10 or 11 I was dropped off at the front like other kids, going in as soon as the theater had been cleared from the last feature, finding my favorite spot (a few rows back from the front, a third of a way over from the right side of the screen so I could see it all without feeling like a ping pong ball. There would be 20 minutes or so before the previews began, and other kids would be jostling for their favorite spot. We weren't just latchkey kids -- we were dropped off theater kids, and we savored every preview, every second of a film, even reading every credit at the end of the movie before finally allowing an usher to shoo us away, then waiting inside Wendy's or out on the front curb of the theater for folks to come pick each of us up. Even just passing by raises memories... especially once I started high school at Parkview and passed it twice a day. I do recall that Top Gun was on just about the entire summer of 1986. By the fall of 1989 I was old enough to drive myself, and a group of us would go at once. Or me and my best friend would get the first matinee tickets on Saturday when a really cool movie was coming -- because matinees were cheaper. And then I went to college. I came back for a year, headed to my first TV job in Jonesboro and returned in the fall of 1998. By this point the UA University Quartet was closed, and the UA Four was a TV studio. 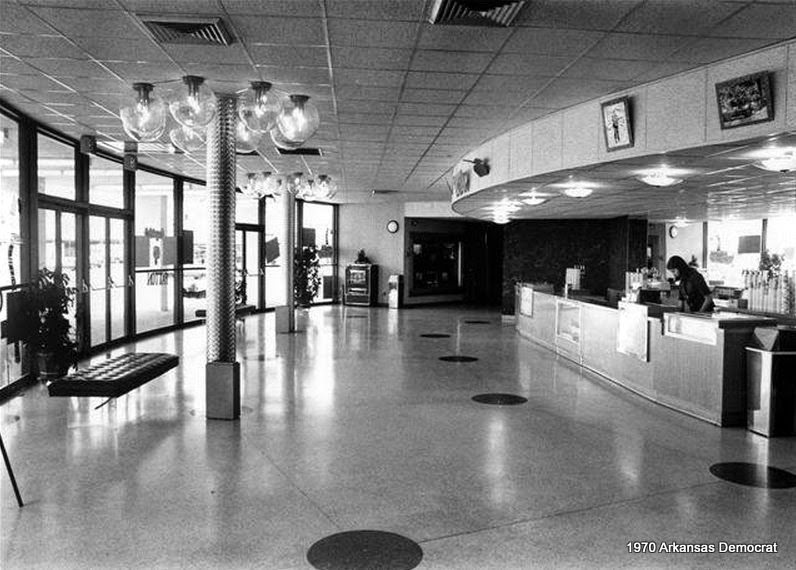 New facilities like the UA Lakewood 8 in North Little Rock and the UA Park Plaza 7 had drawn away the crowds from the southwest side of town, and the neighborhood was in decline. Where I had once told people proudly how I lived and grew up not two miles from the Cinema 150, now it wasn't such a proud landmark. Casa Bonita was gone and so had a lot of the shops I used to go to in the Village Shopping Center (save Hancock Fabrics, which would survive a few years past the Cinema 150's demise). 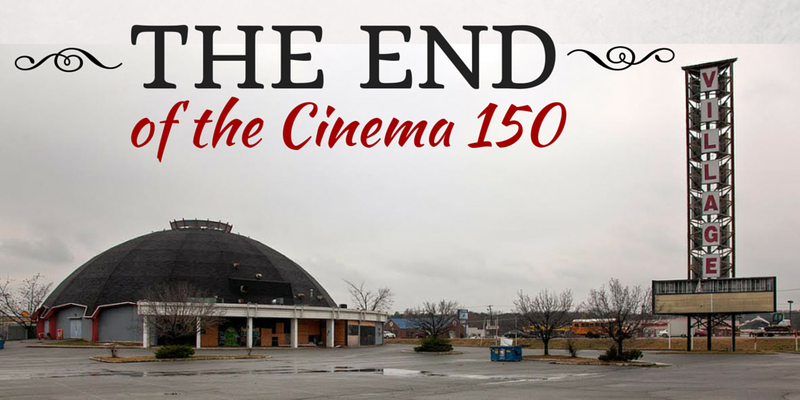 There wasn't a whole lot of notice when the Cinema 150 was to close that night in 2003. X2 (the second X-Men movie) was playing, and my husband and I decided to wake early and catch the movie before I had to go to work that night. Buying tickets felt like opening a funeral program. There was chatter all around, and though the showing wasn't a sell-out, there were hundreds that sat and watched from the previews through the watery credits. Because I had to be at work at midnight, I wasn't at the very last show, but my friend and colleague Bill Ritter was. He came in to work and brought me a souvenir from the last moments the theater was open -- a roll of film, the trailer for Finding Nemo. The next day, curtains were already being piled in skips outside the open double doors. For what may have been the very first time, you could see right through a set to its mates on the other side as you passed on University. I heard the people that owned the building slashed the screen before turning it over. I also heard that they specifically determined no movies were ever to be shown there again. There were other developments over the years. 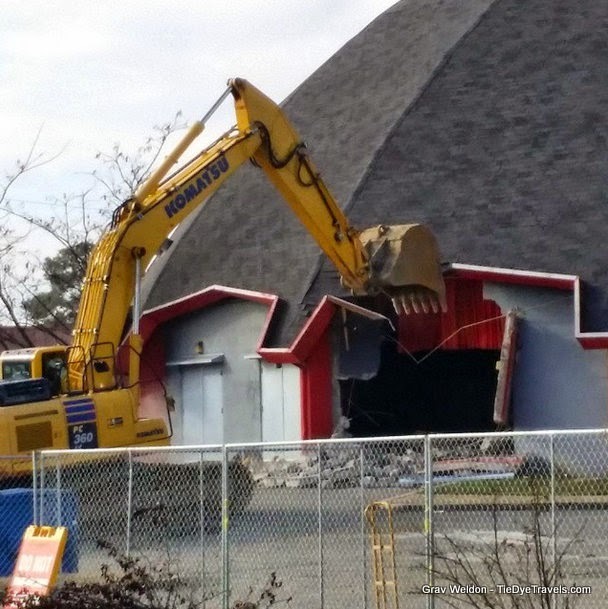 A restaurant, a concert venue, an attempt at a playhouse. Nothing stuck. 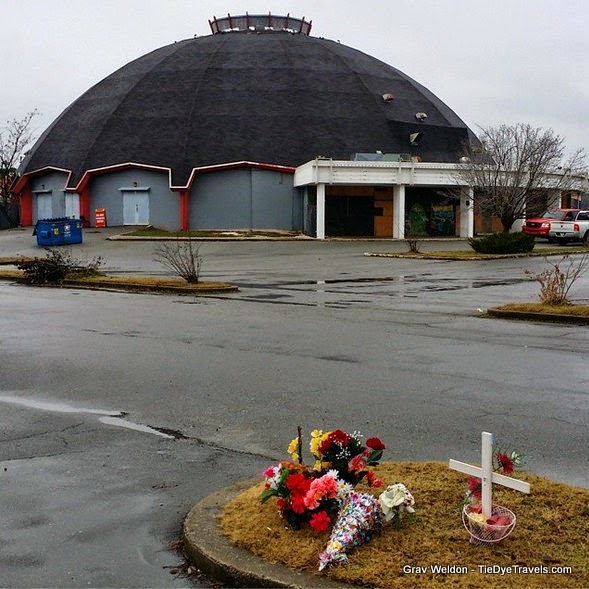 Finally it just sat empty, with someone occasionally voicing the opinion that someone should save it, that it belonged on the National Register of Historic Places, why didn't UALR buy it? But it sat for 12 years. Tomorrow morning, it will be gone. 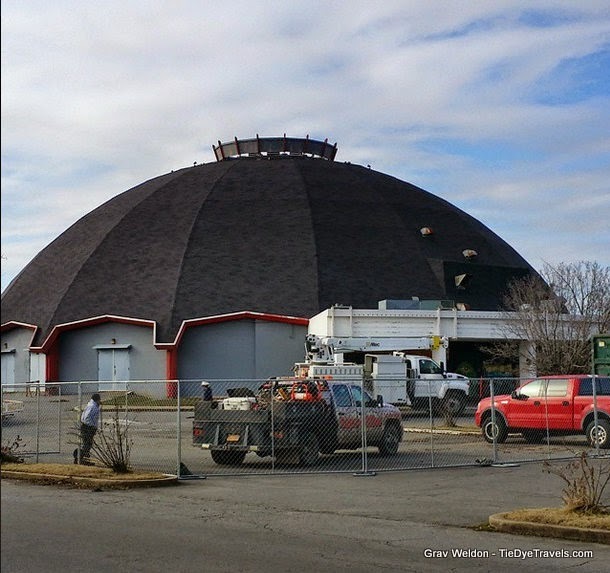 A new company has purchased The Village Shopping Center and removing the old dome will mean better street visibility for the new businesses that will take their places in the long strip mall behind it. Chances are, it'll be replaced with other buildings that won't have landmark-style appeal. I know, I know, the building's structural deficiencies would make restoring the old theater problematic, if not financially irresponsible. That doesn't change the loss to the intersection -- once the busiest in the entire state. 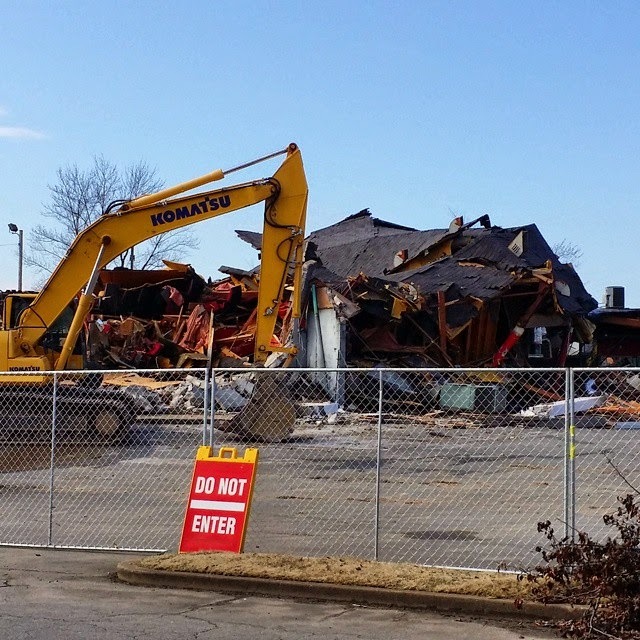 It marks the final landmark to disappear from the booming era of Asher Avenue, which used to be lauded as Highway 70 and which took people over to Broadway. There are many who will point out its significance as being the place where True Grit and End of the Line premiered, and who will talk of date nights where a Cinema 150 movie was matched up with dinner at Casa Bonita. 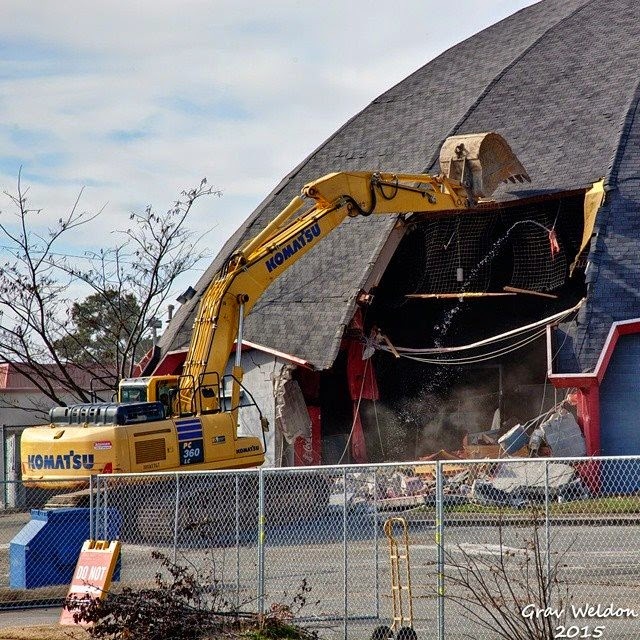 The end of the dome means an end of a long era, and I am sad for that. 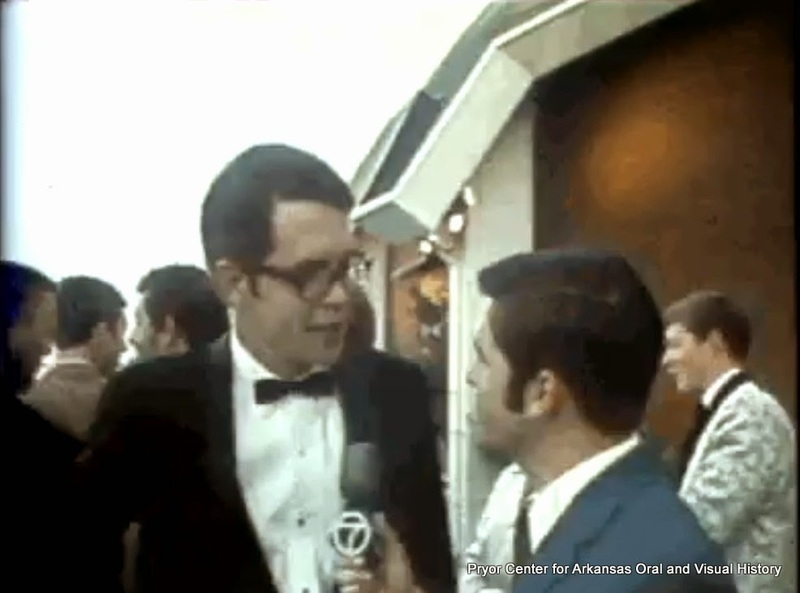 Before my time, the premiere of True Grit was a major Arkansas event. Check out a television story on the premiere, complete with interviews with Charles Portis and Glen Campbell, here. Demolition day photos from Grav Weldon. 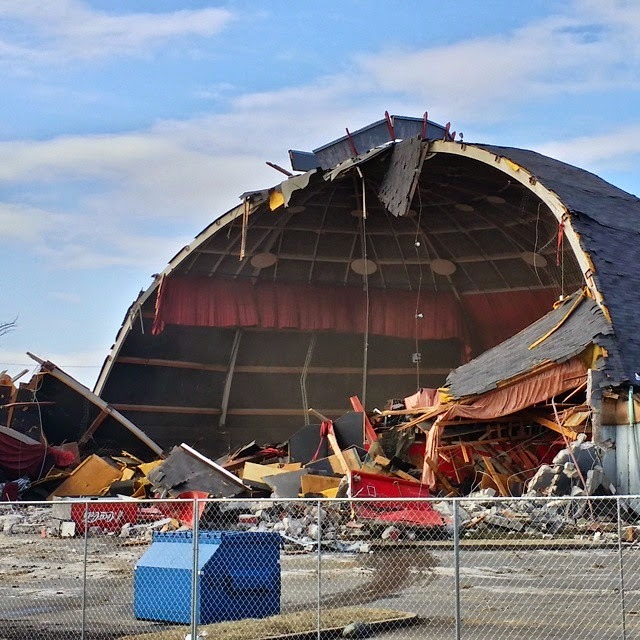 There were a lot of these theaters in California, but many of them got split in half with a wall down the middle and several have also been torn down. We're trying to save the remaining unspoiled ones now. Shame that this one even closed, let alone slated for demolition. They should build NEW theaters like this- most new ones are like broom closets in comparison! 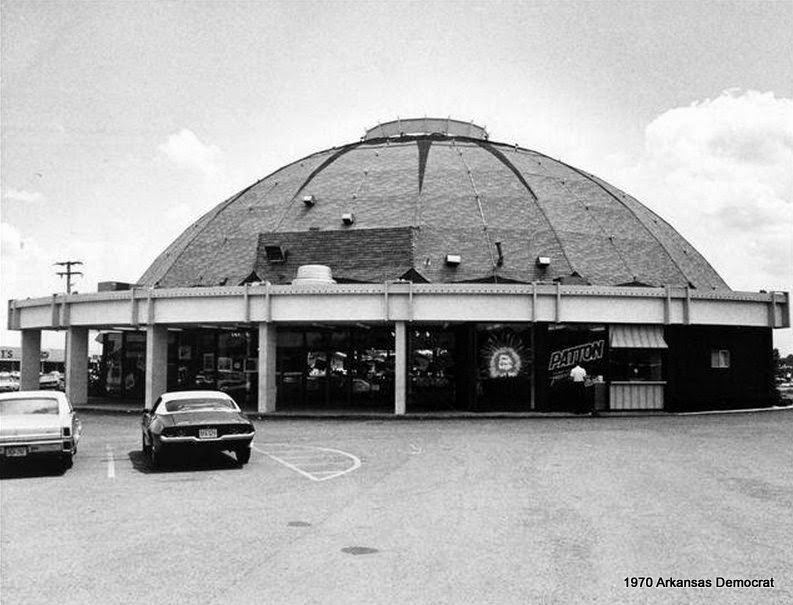 This is another precious piece of the Little Rock I grew up with gone forever. Thomas Wolfe was partly right. You can go home, but you won't recognize it when you get there. This is accurate in every detail. I saw many of the same movies there and this brought back the smell of the theatre, the excitement and even awe you felt walking up that red-carpeted ramp. Thanks much.